Every semester, the University of Stuttgart and the University of Hohenheim present lectures for children between the ages of 8 and 12. Why not get acquainted with the university in childhood? The Children's University makes it possible. In lectures lasting one hour on average, professors answer exciting knowledge questions. Since 2007/2008, both universities offer one or two lectures each semester for children between the ages 8-12. Not only leaves, but stems, roots and flowers are full of surprises when seen from the inside. Spherical, sack-like and elongated cells lie side by side, like alien cities connected via tunnels. These cells have control centers, factories for producing food and construction materials, waste disposal units, transport bands, vehicles, power plants and storage rooms – all incredibly small and very practical. These cells are built of familiar materials: protein, fat, sugar and genetic materials, not to mention water, and sometimes layers of salt and crystals. It is truly amazing that these perfect structures and micro-machines grow all by themselves and remain stable for a long period of time. The diversity of life today is only possible thanks to the construction techniques that have been developing in nature for millions of years: from plants to spiders, from humans to jelly fish, and from mushrooms to bacteria. And as if that wasn’t enough, every living creature is also home to many “tenants”, whether these are useful or damaging viruses, or even fascinating luminescent mushrooms that attract insects at night. Thank goodness that we have microscopes, through which we can see these tiny miracles. Professor Christina Wege will be explaining these wonders in her lecture on 24 May. Auditorium 47.01 at the University of Stuttgart’s Campus Vaihingen is reserved for children only during the lecture. Accompanying adults can watch the lecture via video broadcast in the adjoining auditorium 47.02. Both auditoriums are located at Pfaffenwaldring 47 on Campus Vaihingen. For anyone who misses out on tickets, here is a small consolation: The lectures at the University of Stuttgart are streamed live on the internet and then stored as a downloadable video. Please note: We position cameras in the auditorium so that we can broadcast the lectures live on the internet and make them available for downloading. The cameras are set up to show the children only from the back, i.e. they are not identifiable. Only in case children turn around or lend the professor a hand up front may they be recognizable. We also take still photos on which the children – possibly along with other young students – may be identifiable. These stills can also be called up later on the Internet. To stream the live transmission a data transfer rate of at least 1.5 Mbit/s is required and recommended. Streaming starts on the respective day of the event at 4 pm. Online registration for the summer semester 2019 is only possible via the Stuttgarter Zeitung. The registration period is expected to begin on May 8, 2019. Two seats per registration may be booked for any given date. If your sign-up is successful, you will be able to download the seat reservation confirmation directly. Please print out and bring it to the lecture. From the "Hauptbahnhof", "Stadtmitte" or "Feuersee" stations, take S-Bahn lines S1, S2 or S3 in direction Vaihingen, Flughafen, Filderstadt or Herrenberg and get off at the "Universität" station. Bus: Linien 82, 84, 92 bis Haltestelle "Universität". Take Autobahn A 831 from Stuttgarter Kreuz toward "Stuttgart-Zentrum," to the "Universität" exit. Please use the parking lot behind the buildings located at Pfaffenwaldring 7/9. 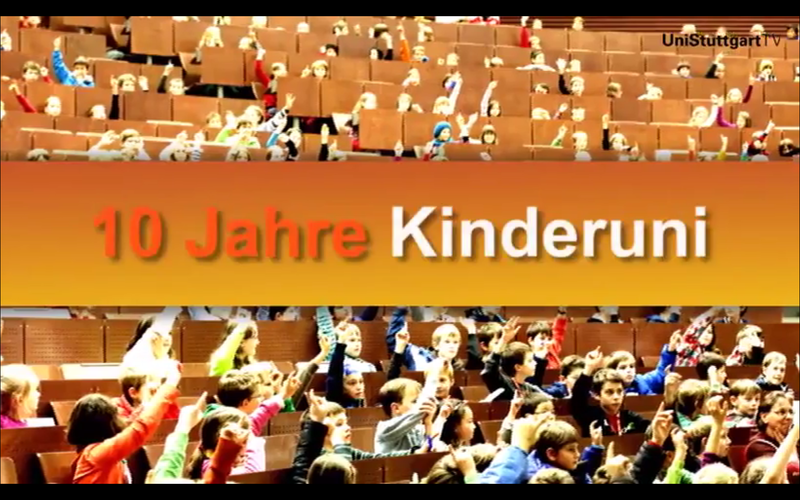 The Children's University newsletter keeps you up to date on selected events for children that are taking place at the University of Stuttgart such as Children's University lectures, Kids Campus, and Kids Week. Subscribe to the Children's University newsletter by filling out the following form. You will shortly receive a confirmation via email to ensure that your truly are the person who wants to receive the newsletter. After receiving this confirmation you will be added to the mailing list and receive a welcoming email. We are using a hidden mailing list, i.e. the list of all subscribers can only be viewed by the admin. Please note: Without providing your email address we cannot process your subscription to the newsletter. Providing your email address is voluntary, you can unsubscribe from the newsletter any time. Your email address may allow others to draw conclusions about your person. According to §§21,22 LDSG you have the right to request information as to your data which the marketing department of the University of Stuttgart has saved. Should the saved personal data be false you are entitled to request the correction of the personal data. If you want to be deleted from the mailing list, please send an email. Please note that you have to use the same email with which you are registered on the mailing list to unsubscribe. You do not have to fill in the subject heading and text box. The Children's University of the last few years covered many exciting topics. Here you will find an overview and videos of the lectures. Will I still be able to touch my pocket money tomorrow? The events take place in Auditorium B1 at the University of Hohenheim. It is exclusively for the children’s use. Accompanying adults can watch the video transmission in Auditorium B3. See more information on the University of Hohenheim Children´s University web page. A joint initiative with our partners at the Stuttgarter Zeitung, the University of Hohenheim and the Initiative for the Advancement of Gifted Children e.V. We sincerely thank Stuttgart Student Services for its support of the Hohenheim-Stuttgart Kids University.